Thank you to all those of you braving the winter cold here and else where in the Northern hemisphere and are continuing to plant crystals as and where you can. No new planting records for this week, but several crystal orders are going out which feels good and we are busy making plans here for several crystal planting trips both locally and further afield. If you would like to plant crystals to help our beautiful planet and her inhabitants and don't know where to start have a look at The Crystal Earthworks website (see links) and get in touch if you would like any further information. 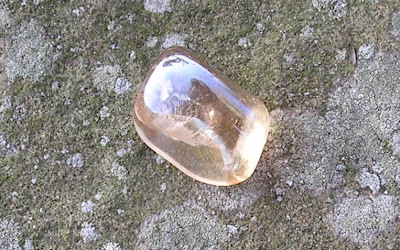 A specially programmed rose quartz will be ignited at 8am GMT tomorrow 25th January and remain active until 8pm. This is in support of a day of prayer for Zimbabwe on this date. Please connect in by sending prayers or focusing on the image of rose quartz above at any time between the hours given. Although crystals can be planted at any time of year some of the sets to do with the cleansing of the earth and regeneration of the natural world may bring about optimum healing when planted in winter when much of the plant life to an area is dormant and animal life is hibernating. This is particularly applicable to areas of the globe where the seasons are marked. Planting in the winter months literally prepares the way for maximum growth and renewal in the spring. Just as you might physically mulch the garden in winter, in light terms by planting specific crystals at this time you are feeding the earth with light to cleanse and strengthen all within. Such crystal planting will also help the survival of animals, birds and other life at what is often a time of great vulnerability and challenge. A Pure Strength set consists of a Pure Grace Heart and four malachite as shown in the photograph below. This configuration brings healing, alignment, and strength to the natural world, facilitating cleansing, strengthening, renewal, growth and regeneration. It has a particular relevance to trees, so essential to life on our planet yet will also support the natural web of life at all levels. These sets are ideally planted to forests, woodlands and wildlife parks and may be planted at any time of year, yet winter planting for the reasons described is particularly effective. Once the crystals are in place they will work in perpetuity and will be naturally cleansed by the elements. The set is best planted with the Pure Grace Heart to the centre of the allotted site for planting and with the malachite to the centre of each of the edges of the site in the configuration shown in the photograph or with the malachite to the corners of the site depending on ease of access and what intuitvely feels best for a a particular area. 'For sustained peace and healing to the Middle East'. 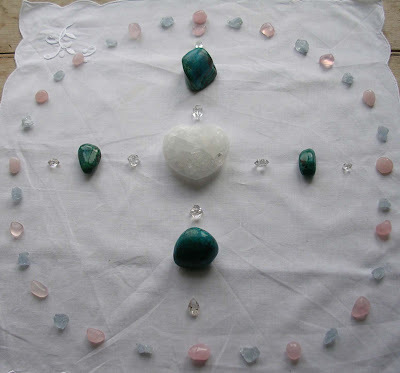 The image above is of the special crystal configuration for this meditation. Please use this as a positive focus. 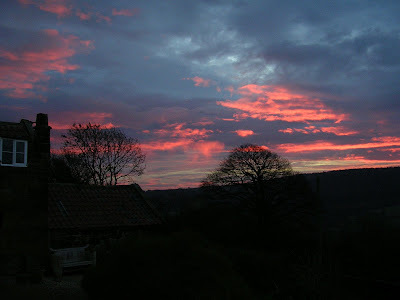 Woke up to this beautiful, yet stormy sky this morning - unfortunately not had chance to write about the Pure Strength sets as further meditations for peace in the Middle East have felt to be the priority. 'To bring strength, peace and protection to all animals in difficulty'. Please use any positive image of an animal you are drawn to as a focus. 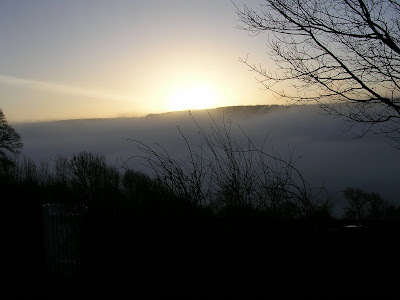 Hope you can join us - further details are available on the meditation page of The Crystal Earthworks website. Records received to day for the planting of several aura crystals to key buildings in London,UK and in Palma, Majorca. Also for planting of Pure Strength set to Belver Woods in Palma and Pure Grace Heart to Lluc in Majorca and for a further Coastal Rose Heart in Scottish waters to the mouth of the river Annan. Details of the aura planting projects and Coastal hearts project are available on the Community Planting page of the projects website - see links. Details of the Pure Grace hearts are given on the blog posting 8/03/08 and I hope to write more about the Pure Strength sets on Friday as this is a relatively new way of working which feels increasingly important for the planet in current times. 'For peace in the Middle East'. This meditation will be held tonight, 5th January, through 8pm GMT and will use a fist sized piece of rose quartz set in a ring of rose quartz - please use the image below as a focus. Thank you for your connection and wishing all across the globe greater peace in their lives through the coming year.